You were out partying with friends and consumed your fair share of alcohol. Feeling the effects of one too many wine coolers, you decide to be responsible and call yourself an Uber. After all, you know you are too intoxicated to get behind the wheel. As a responsible adult, these are the scenarios we imagine when we think about how to avoid being charged with Driving Under the Influence of Intoxicants (DUII). More commonly referred to as a DUI when referring to drunk driving, most of us know the basics of what it takes to get popped with this unfortunate charge. Here at Donahue Law Firm, as a DUI lawyer in Bend, we have helped countless people who are facing a DUI conviction. Unfortunately, the cases aren’t always as cut and dry as a night out partying and sitting behind the wheel of a car. Often, people who face this charge are well-meaning, responsible adults who didn’t realize they were over the legal limit or were unaware of a specific detail of the law. Read on to learn more about the five surprising times you might be in danger of a DUI and not even know it. In the beginning of this post, we talked about how a responsible adult might handle a night out where alcohol consumption was heavy. Calling a taxi or other rideshare is a great way to protect yourself from driving while over the legal limit. However, imagine that this same person decides to go pick up their car early the next morning. Dropped off by another ride, they hop behind the wheel without further thought. A little fuzzy from the night before, they roll through a stop sign and are pulled over. The cop asks for a breathalyzer test and they concede, without a worry in their mind. The next thing they know, they have blown over the legal limit and are facing a DUI. How can this be? After the late night partying, you go home, get a solid night of sleep, and no longer feel intoxicated. The reality is though, that the next day, you can still have a Blood Alcohol Content (BAC) level that is far over the legal limit. A variety of factors will dictate whether or not this is true. Your body weight: For smaller people with less body mass, alcohol will have strong effects and stay in the body much longer. What you ate: If you skipped dinner or snacked on something late at night after you already had a number of drinks, your body will not metabolize the alcohol as quickly as if you drank on a full stomach. How intoxicated you were: Depending on what level your BAC was when you went to bed, you might not reach a sober state for longer than a night’s sleep. How long you slept: Did you crash for five to six hours or did you pass out for a solid 12? The amount of time since you took your last drink will play a large role in your chances of being sober the next day. These are just a few of the factors that might affect your next-day sobriety. The best plan of action is to avoid driving the morning after a big night out. Even if you feel sober the next day, your BAC level might not pass the legal limit. Try to abstain from driving until much later in the day. Here in Oregon, we are no stranger to a variety of delicious craft beers. With Deschutes Brewery based right here in Bend, the craft beer scene is a true part of the local culture. However, with the rise of craft beer has come an increased risk for DUI. Many adults spent most of their lives accustomed to lighter beers and had a good understanding of when they were over-consuming those beers. Unfortunately this does not translate to craft beers. When it comes to craft beer, many of the newest releases boast extremely high Alcohol By Volume (ABV). With some of the heftier beers boasting an ABV as high as 12 percent, it is no longer the game of “I can drink a few beers and be fine.” For some adults, even two of these potent beers will push them right over the legal limit. Instead of trying to keep track based off of the number of beers you have consumed, pay attention to the ABV of the beers you have consumed. Consider beers with a high ABV to be more akin to drinking a large glass of wine. It’s an age old problem. Just as when you are going on a diet and you start counting calories and have the realization that you have been consuming far more than you previously thought, we tend to underestimate how much we have actually drank in an evening. This can be particularly true if you are stationary. For example, sitting at a bar or hanging out in a friend’s backyard, it can be easy to grab drink after drink without keeping an accurate count in your mind. So often, those who are pulled over and charged with driving under the influence are convinced they didn’t have that many. An old bar trick is to keep a napkin from every drink you order. Having a physical representation sitting in front of you, such as a pile of napkins, will help you keep a more accurate count on your alcohol consumption. The best tactic is to simply arrange for a ride home when you drink rather than trying to keep track of what you have consumed. If you are a petite female hanging out with a six foot tall, large framed man, the same amount of alcohol will affect you differently. Going drink for drink with someone who is much larger than you can result in faster intoxication for you. Make sure that you always take into account your size and weight when drinking. Just because your friend is still under the legal limit doesn’t mean that you are, even if you consume the same amount. Perhaps you reach the end of a long night of festivities and realize, getting behind the wheel might be a risky venture. You decide to do the responsible thing and sleep it off. You climb into the backseat of your roomy car and settle down for a long snooze. Next thing you know, a cop is knocking on your window and demanding that you step out of the car and speak to him. Before long, you have failed a breathalyzer and, while you weren’t driving your car, being present in your car with your keys in hand can equal a DUI. If you need to sleep off a night of drinking in your car, your best bet is to hand your keys over to a friend so that you can prove beyond a shadow of a doubt that you could not have driven your vehicle. If you have fallen prey to one of these easy mistakes, it is time to get help on your side. 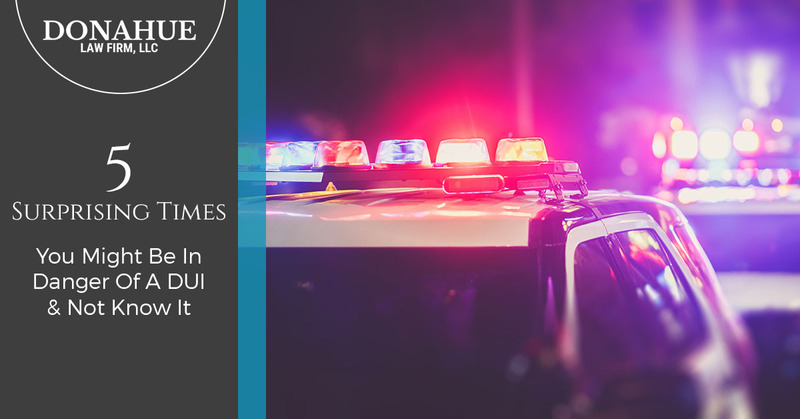 Here at Donahue Law Firm, we can assist you with any DUI charge, no matter what the circumstances were leading up to your arrest. Talk to us today to schedule an appointment to see how we can assist you with the legal help you need.